Let me start by telling you all the things you DON’T need to make this delectable jam: boiling water, a stove, special sealing lids or any of those other terrifying (to me anyway) canning type of things. The only reason you need a mason jar is because your raw strawberry jam is going to look pretty in it, and if you don’t have a mason jar, it will look just as pretty in whatever else you have. All you need are strawberries, a little sugar, a lemon, a bowl, a strainer, something to mash them with and about 20 minutes. 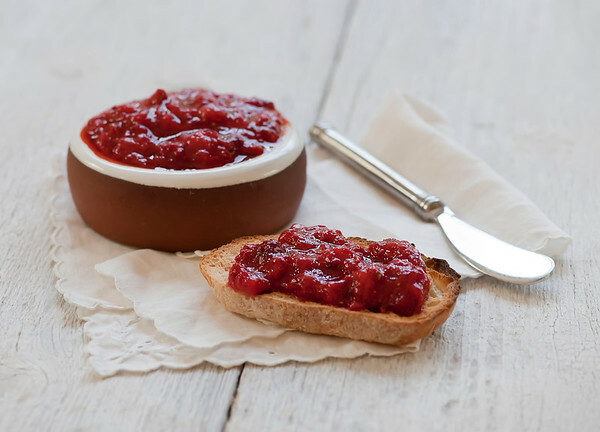 That’s all that stands between you and homemade strawberry jam. Really! The Southern husband started examining the apples on another table like he had no idea who the woman squealing by the strawberries was (can you blame him?) while I took a deep sniff of the strawberry aroma. 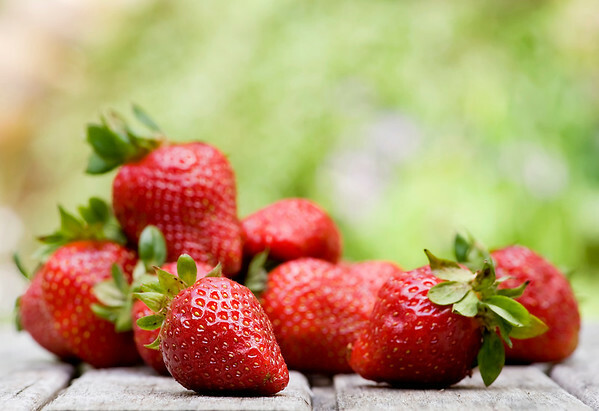 That’s the best way to know you have tasty strawberries – they smell like strawberries. The ones you find in February don’t smell like much of anything. 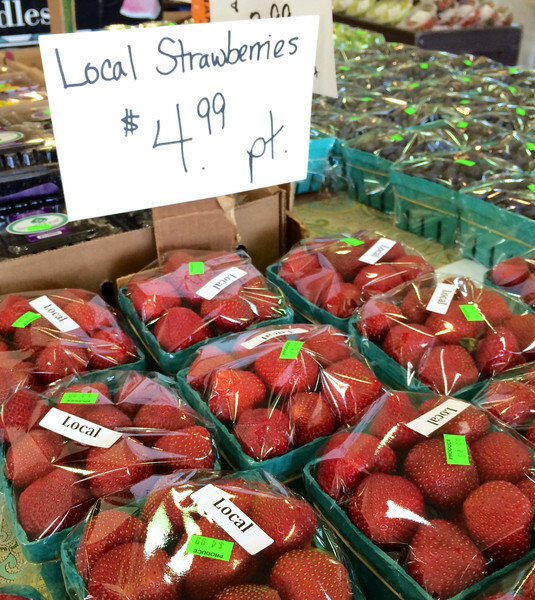 Local strawberries, everyone! Anyway, once you have your berries, you want to cut them into quarters, mash them up (a potato masher works great for this, but a fork will also do just fine) and then mix them up with a little sugar and some lemon juice. Transfer this mixture to a fine mesh strainer and let it sit for about ten minutes, stirring it up vigorously every couple minutes or so. At the end of 10 minutes, let the jam drain without stirring for another ten minutes. And…you are done. You have made jam. You have made JAM! Your fabulous jam will keep for 1-2 days in the fridge, and I admit that I do store mine in a mason jar. I like these cute little ones from Ball. Things that your jam will taste amazing on? Toast. Banana bread. Scones. Sandwiches made with your own homemade peanut butter. So the first time the local strawberries roll around? Pounce. And make jam. And be very happy. Place the berries on a rimmed baking sheet and mash them with a potato masher or a fork until they are very well mashed. Scrape them into a bowl. Mix in the sugar and the lemon juice and stir well. Transfer the jam to a fine mesh strainer. Let the jam sit in the strainer for 10 minutes, stirring vigorously every couple of minutes or so. After 10 minutes have passed, let the jam drain for another 10 minutes. Jam will keep in a covered container in the fridge for 2 days. WOW; that is quick and easy. I use the water bath method when making jams and some I make and put in freezer and was wondering if a person couldn’t make and freeze this as well. I *think* you should be able to freeze this. I’ve never tried it (it goes too fast!) but I don’t see why that wouldn’t work. And yes on the ice cream!! I like the thickness of which you do yours, plus I like trying different ways of making jams and jelly’s. Thank you for the recipe by the way. um, why does it sit in a strainer, do you not use what falls through, or is that the jam? los angeles, has harry’s berries, they are delicious and aromatic from afar, a reason to visit the santa monica farmer’s market. It sits in the strainer so a little more of the strawberry juice can drip out, so your wonderful jam is more solid and less watery. The berries sound fantastic! Strawberries!! Just the sight of the, makes me giddy. I want to have this jam smeared all over my life.